Whether it's basketball, baseball, soccer or all of the above, it's the bouncing and sliding the kids will love. 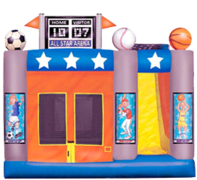 The All Star Arena is a sports themed bounce and slide combo with inflated pop-ups mounted to the floor. There's an inflated basketball hoop on the inside and the outside of this "5 in 1 combo". All Star Arena can accommodate 6 to 8 children around the age of 6 years old (less for older/bigger children up to about age 12). There are inflated safety steps (not shown) at the entrance and exit to assist participants with getting in and out of the bounce house. This bouncy has high-visibility safety mesh on all sides to allow for easier supervision of children and fire resistant vinyl for safety.